Most of the opposition groups and young leaders of the 25 January Revolution have opened fire on the proposed legislative amendments to a 39-year-old law regulating parliamentary elections. The proposed amendments, released yesterday evening by the Supreme Military Council, introduce a mixed system of individual candidacy and party-list proportional representation, which if approved would be adopted in the forthcoming elections of the People's Assembly – the lower house of Egypt's parliament, due in September. The draft proposed that the individual candidacy system will be adopted to elect two thirds of the Assembly’s seats, while the party-list system would be used to elect the remaining third. Although Shahin indicated that the amendments of the People’s Assembly law will be subject to public discussion before it is finally ratified by SCAF, most political forces were quick to express a negative reaction. The majority of secular opposition parties stood united against the draft law, largely because of its maintaining of the individual candidacy system. Rifaat El-Said, chairman of the leftist Tagammu party, argued that “the amendments send a very negative signal about reform in the next period because espousing the individual candidacy means that the new elections will produce a parliament dominated by businessmen and old guard MPs, as has been the case throughout Mubarak’s era.” El-Said also lamented that the amendments stopped short of imposing a ceiling on spending on election campaigns or a ban on raising religious slogans. Joining forces with Al-Said, Sameh Ashour, chairman of the Nasserist party, wondered why “SCAF insists on maintaining the individual candidacy which had been largely responsible for the proliferation of vote-buying practices and thuggery and violence during the 30 years of Mubarak's rule." 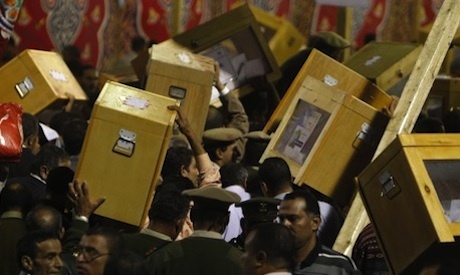 Leaders of Muslim Brotherhood said they were not favouring a particular electoral system over another. “We are in support of a system which gains the broadest margin of approval from political forces,” said Saad El-Husseini, a member of the Brotherhood’s Higher Supreme Guidance Office. Shawki also laments that the amendments kept silent about the widespread demand that Egyptians living abroad should be granted the right to vote in the next parliamentary and presidential elections. The objections of the January 25 Revolution's youth movements to the new People's Assembly law are expected to be the main subject of a big Tahrir Square rally planned next Friday. Hussein Abdel-Razek, a leading member of the leftist Tagammu party, begs to differ with Rabie. “I believe that introducing a mix of two electoral systems will be make very complicated for citizens – millions of whom are illiterate – to elect their representatives in parliament. “I think that all political forces agree that there should a complete switch from individual candidacy which was the hallmark of Mubarak's corrupt and despotic regime to a proportional party-list system which obligates citizens to elect candidates according to their platforms, ideology and programmes, all of which are good for advancing a democratic political climate and healthy parliamentary life in the next period,” said Abdel-Razek. The amendments to the People's Assembly law are currently being discussed by a national dialogue committee. The committee, said Rabie, will take into account all the objections raised against the amendments and them make a copy of its own. “This copy will be submitted to SCAF which will have the final say about the law,” said Rabie.